Wooden Blinds in Living Room Leads to whole house solution - Sew What? Sew Anything! This client was thrilled when we installed these great looking Kathy Ireland 2″ wooden blinds with a matching 3″ valance in her living room. The dark wood looked great in the room, especially next to the brick wall. The wooden blinds were installed to help with the sun and heat from a western exposure, make a cool and comfortable room in the hottest months of the summer.My client was so pleased with the result. After installing these wooden blinds in her living room, we wen on to add blinds in all windows of the first story of the home. This installation was so successful that we went on to add blinds in the lower level too where there were guest rooms and a multipurpose TV and game room. In this case blinds turned out to be a whole house solution. 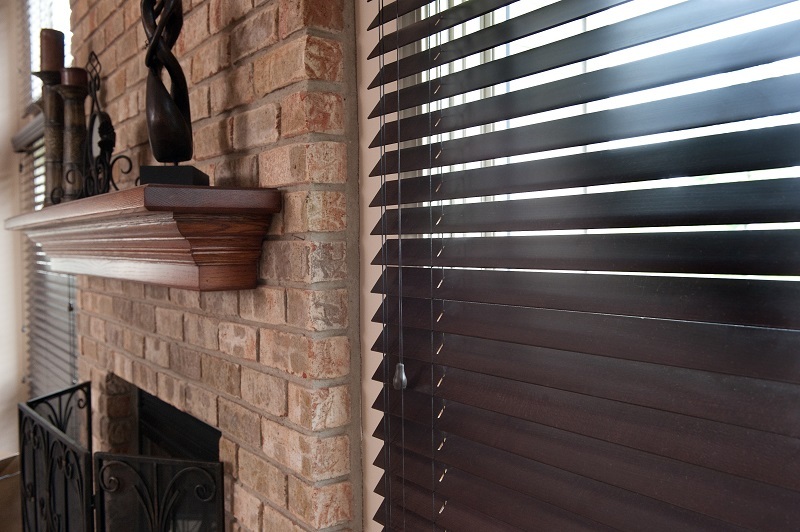 wooden blinds are the best option among other blinds for any room. I recently changed my window blinds to wood blinds and I am having an amazing experience with them. I bought them from Barblindz, they have quality products of such blinds.